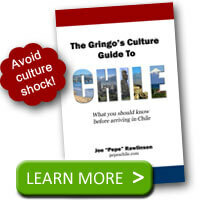 Even though sopaipillas are a common food across Latin America, Chile has its own special variation. Chilean Sopaipillas are round, flat pastries whose dough is shaped into circles about the size of your hand and then fried. The dough is made from Chilean pumpkin or zapallo that gives them an orange color. You’ll know zapallo when you see it at the feria street market because vendors typically cut it into large chunks that highlight its vibrant orange color. The typically fried sopaipillas can be eaten with your fingers. They can be purchased fresh for a couple hundred pesos. No matter where you are in Chile, you’ll likely find a street vendor with a little kiosk selling sopaipillas. You can watch as she forms the dough into the classic sopaipillas shape and tosses them into the boiling oil to quickly cook them. A well-made sopaipilla will be crispy on the outside with a softer center. Sopaipillas can be adorned with any number of toppings. 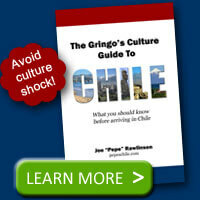 The street vendor will likely have pebre (the favorite Chilean salsa). You can also top one with mustard, ketchup, or the sweet tasting caramel called manjar. 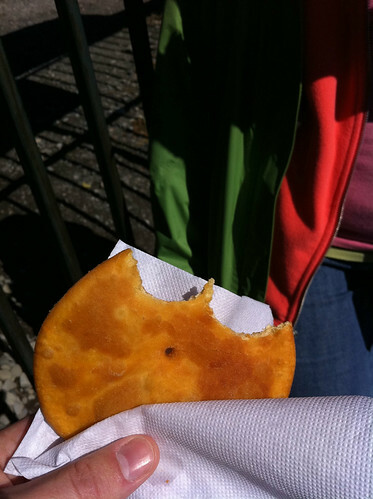 Although you can buy sopaipillas year around in Chile, sopaipillas pasadas are a winter-time favorite in Chile. This recipe features the traditional sopaipillas soaked in a heavy, sweet syrup called chancaca. This syrup tastes like a blend of brown sugar, honey, cinnamon, and orange rinds. You’ll need to eat these sopaipillas with a fork. I’m going to try making them. I’ve already got some successful fritter recipes. I like the idea of the citrus sauce. @Sarah – I’ve never made Sopaipillas myself but that hasn’t stopped me from enjoying eating them. Good luck with your recipe! @MC – Thanks for the correction.